There is a strain in American painting that takes its essential character from the primitive, from a desire to grasp hold of things, to make them present and tangible. It's a reality that goes beyond the visual to the tactile. This was brought to the front of my mind last week when I visited the Wadsworth Atheneum in Hartford, CT, on my way home from visiting my family. I hadn't been there in many years, so seeing the collections was a fresh treat. The museum has extensive holdings of American painting and decorative arts, especially strong in Hudson River School painting. But, except for taking a photo of a Kensett and a Heade in the landscape galleries, my heart and eye were drawn to the strongly linear tradition in American painting. I walked right by the big gallery with the huge history paintings––The Signing of the Declaration of Independence, etc––by John Trumbull, but was riveted by the colonial era artist John Durand's portrait. The color harmonies were beautiful, but it was the clarity of form that particularly interested me. The main forms were outlined, giving them a dramatic presence. 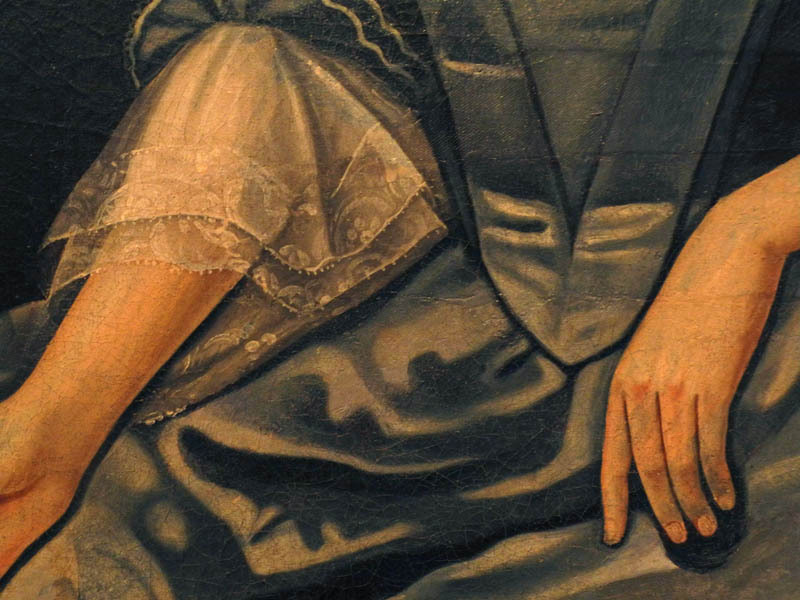 Folds of clothing and drapery were stylized in a way that made them paradoxically both hard and lively. The flesh within its outlines also had life, like that in the figures in Quattrocento painting; brushstroke is deemphasized. In her book American Painting of the NIneteenth Century, Barbara Novak describes portraits such as this one by Durand as being part of a long limner tradition in which untrained artists "presented reality conceptually, as idea, and pinned it down with two dimensional surface patterns characterized by linear boundedness and equal emphasis of parts". 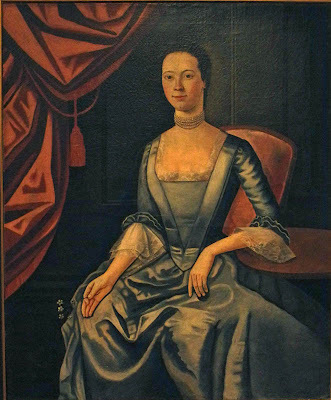 John Singleton Copley, Mrs. Jeremiah Lee, 1769; oil on canvas, 95 x 59 in. John Singleton Copley is the greatest of early American painters, with his works that are classically simple in form and composition; they are portraits of clear character, powerfully present. 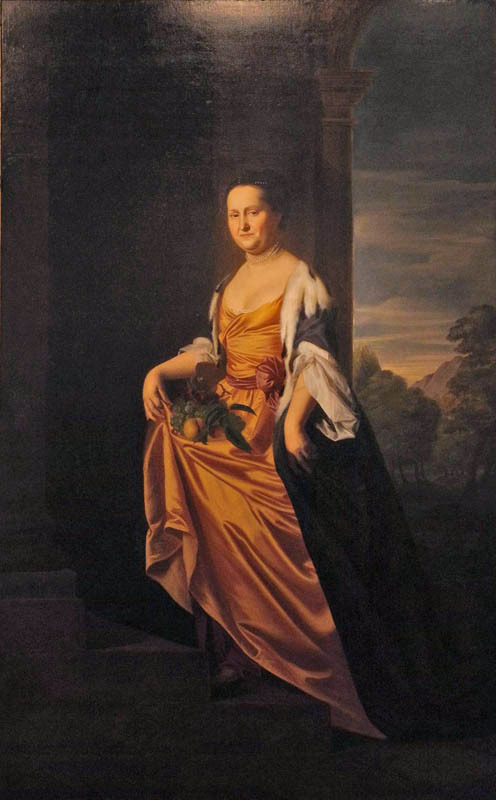 This large portrait at the Wadsworth is a stunning achievement, with the forward movement of Mrs. Lee balanced by the view into an open landscape. In comparing this detail with the one above, we can see how Copley took the limner tradition and softened it, making the forms more volumetric, less stylized, although he still owes a great deal to that flat, conceptual tradition. I think of him as defining the American character in painting in his early career; when he moved to London in 1774 he began to make large history paintings, the most famous of which is "Watson and the Shark", completely different from his American work; linear gave way to painterly, and clear planar compositions became curves in space. 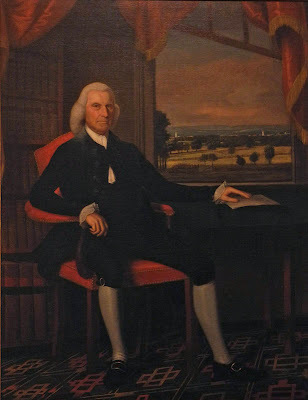 Ralph Earl, Colonel Samuel Talcott, 1791-92; oil on canvas, 71 1/4 x 53 3/4 in. I really liked the clarity of this painting and the forceful presence of the man portrayed. Like the Copley portrait, it owed a great deal to the more primitive tradition of American portraiture. 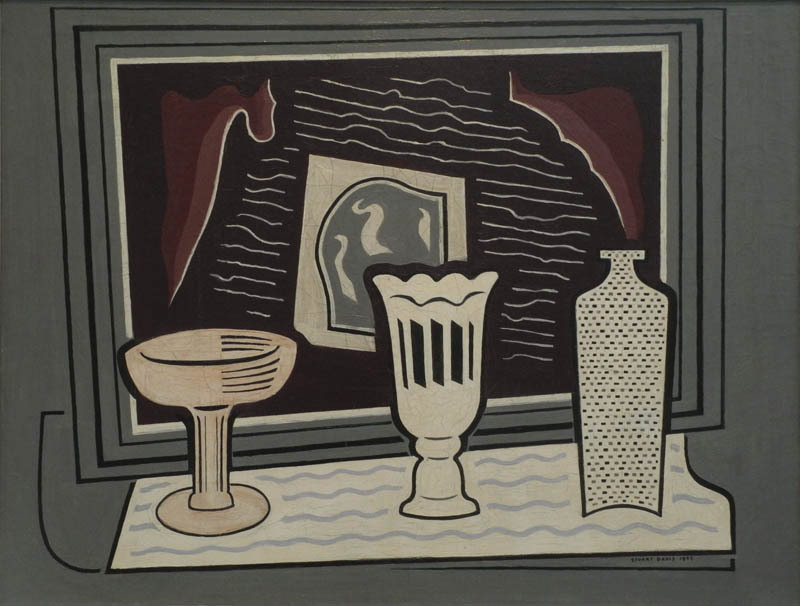 Novak describes Copley in a way that also applies to this Earl portrait, as practicing a "conceptual realism" in which "abstract knowledge is fortified by the stuff of empiricism....The object, as it were, presents itself, and the result is a 'higher coefficient of reality', making the real somehow more than real." Sarah Miriam Peale, A Slice of Watermelon, 1825; oil on canvas, 17 x 21 13/16 in. 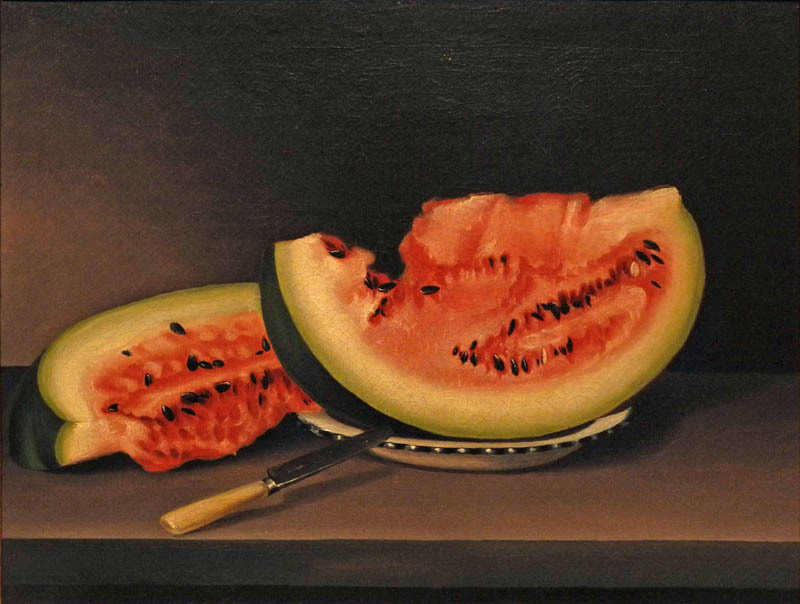 In her "portrait" of a watermelon Sarah Miriam Peale brings that fruit to solid and present life, each black seed tipped with its small highlight. I couldn't resist including this marvelous lion in this post of more conventional paintings. His wise and charming face, with black ears and eyebrows, stares out at us calmly, the lines of nose and mouth continued down into the black chain encircling him. 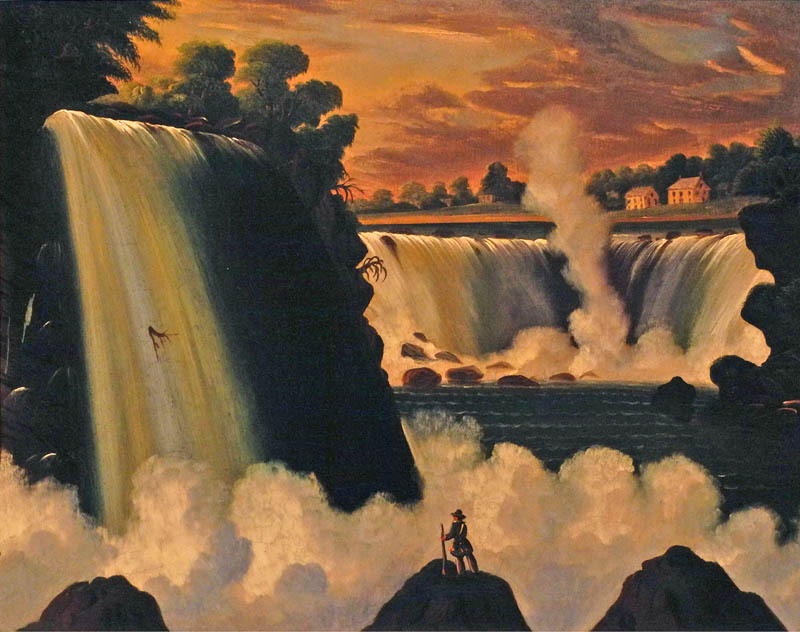 The brilliantly colorful landscapes of Thomas Chambers (who I wrote about here, where you can see more images), go back to the primitive tradition in American painting. He worked mainly from black and white prints, but managed to achieve a gorgeous light and color. George Catlin, Catlin the Artist Shooting Buffalos in Texas with Colt's Revolving Pistol, 1855; oil on canvas, 19 x 26 1/2 in. George Catlin specialized in paintings of the West, including many beautiful portraits of Native Americans. 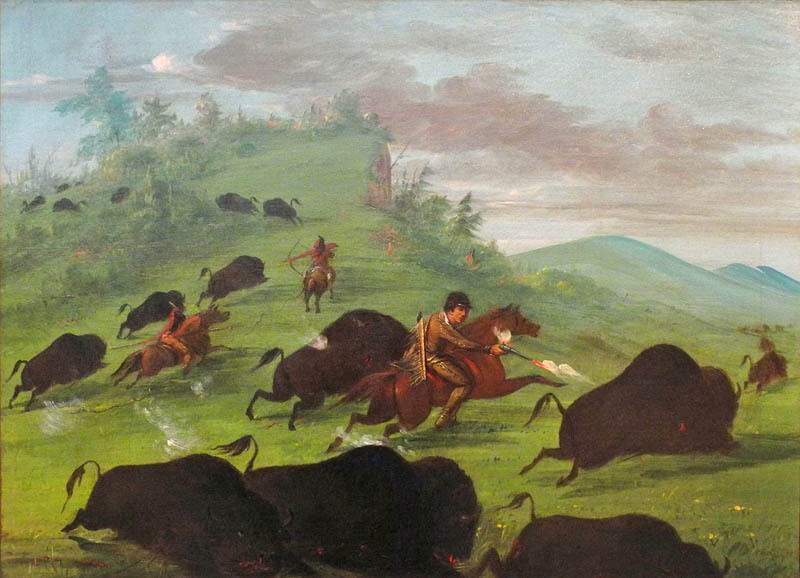 In this painting, he is showing one of the shameful aspects of American history, the slaughter of the giant buffalo herds, although he is here celebrating his prowess. But what could be more American than guns, unfortunately. 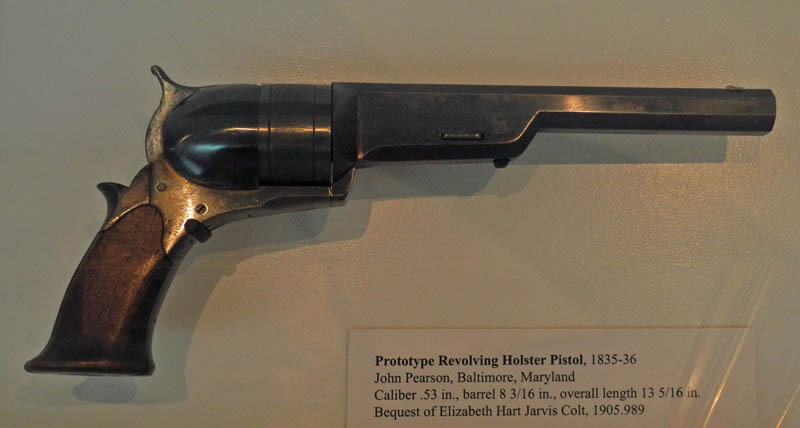 The gun shown in the painting above was displayed right underneath it in a glass case, along with many other Colt weapons. Their first manufacturing plant was near Hartford and the Colt headquarters is now there, where the Wadsworth Atheneum is located. It is hard to argue for a purely American sensibility in the early 20th century, since so much was influenced by European painting. But the museum had an interesting collection of this period, with some beautiful paintings, and these three fit a theme of clarity. I love the subtle color of this Marsden Hartley painting, and the almost humorous circle at top, orienting the image as a portrait. 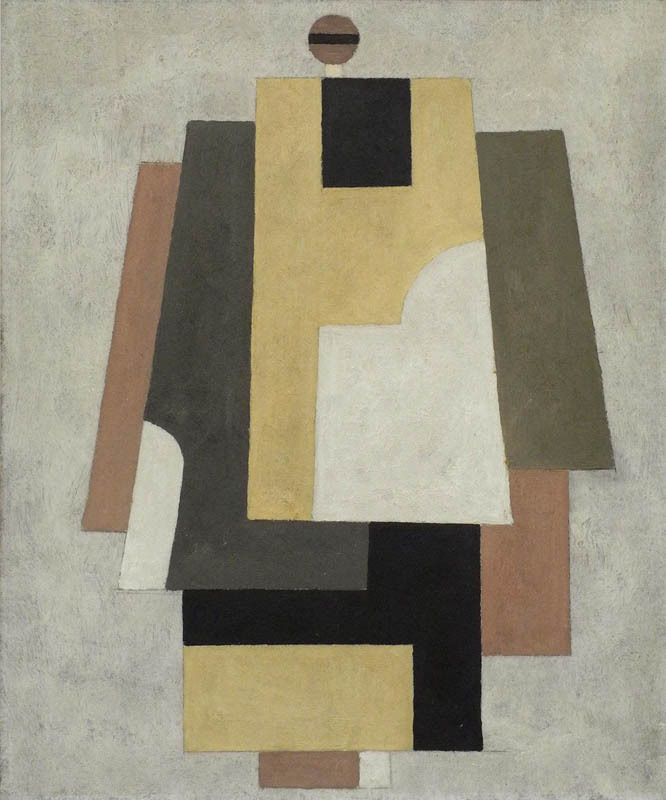 It's interesting to think of this Stuart Davis painting in relation to limner tradition as in the first portrait shown above, though of course he is a modernist. 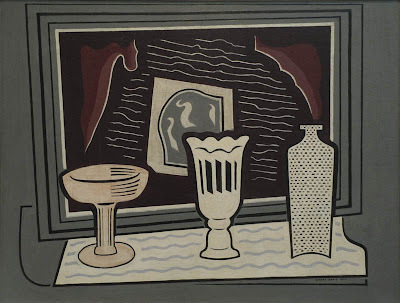 I liked the simple presentation of objects as on a stage, like characters in a drawing room comedy. 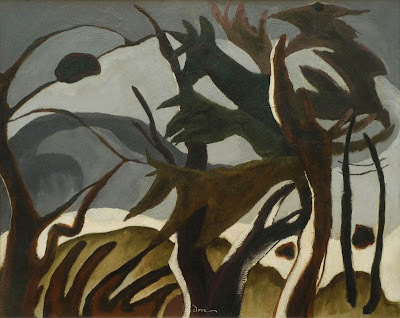 A beautiful Arthur Dove, in which we sense a tossing movement of wind in a gray landscape. 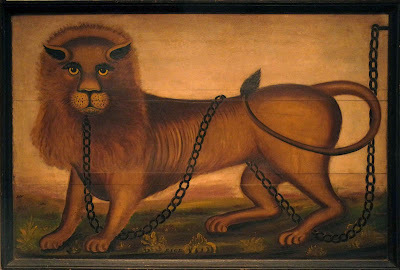 On this page and the next of the Wadsworth's website you can see some very wonderful small paintings by Dove in their collection that weren't on view. I think of myself as following in this tradition of American painting, so my interest is quite personal; it is not the only tradition, but one that seems an essential part of our history. Your thoughtful, informative blog balances out much of the opposite I see upon return to the U.S. Always thrilled to meet new Doves! Thanks so much, Julie. Welcome home! aren't those Doves beautiful? Thanks for the trip to the Atheneum. We've been meaning to get up there, and now we've at least gotten some of it. 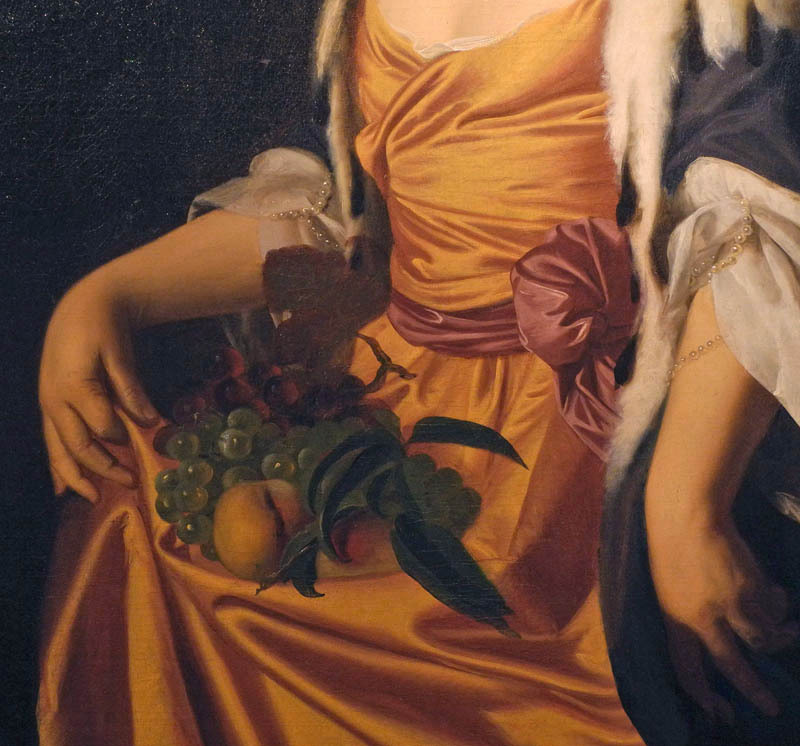 Kim, an interesting line from Vermeer to watermelon seeds. I'm glad you enjoyed this small tour.